Found yesterday by my daughter while cleaning in the basement. She also found some of my mom’s books including a first edition of a D.H.Lawrence poetry book (#29 of 1000) signed by his wife. This little undated painting is of my parents standing outside a house they rented in the South of France. This brought back many happy memories. I did this from a photo but I’m not sure where the photo is. I caught something of my parents in it especially my father’s thin legs. Ideas generate ideas and the more art you do the better. Lying in bed this morning I thought of some things I may do on this one: markings in the white space, words, borders around the whole or the individual squares and such. On the other hand I like this. It looks clean (although I could have done a better job with the placement of the squares) and seems pretty complete. 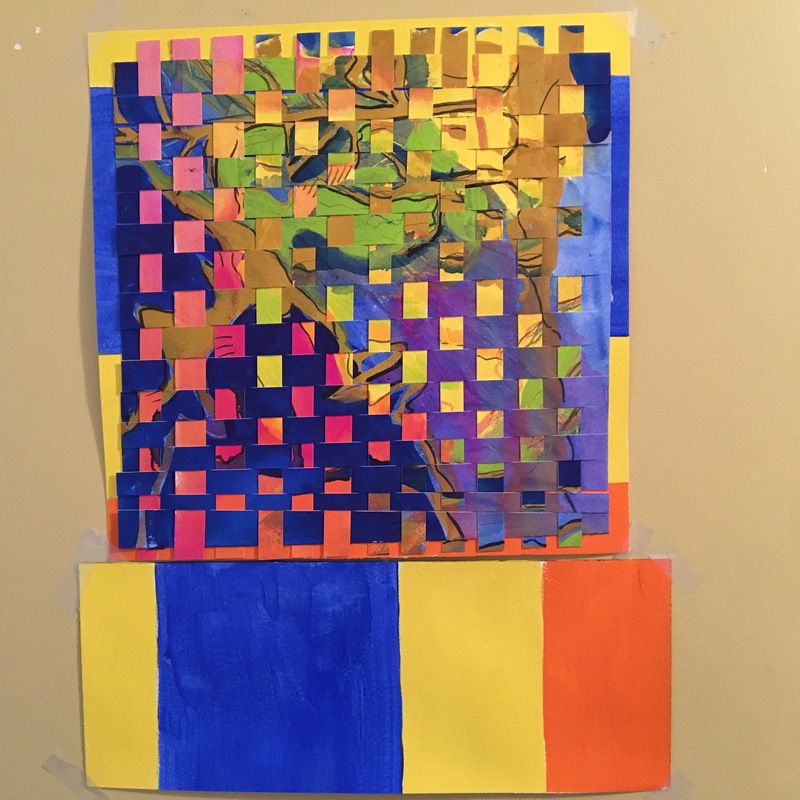 I painted a background on which to mount the second woven painting. I did these for fun but I’m thinking if I ever had a little exhibit I’d frame and show them. They are a bit irregular which bothers my OCD but it is what it is. The stripes got lost because this is woven pretty tightly–no space to show the colors throughout. Next time I’ll leave some space. And I have some extra for the next venture. These are the edges of the woven piece from yesterday. Not exactly a grid because they are all different sizes but I may try doing a Kerfe style grid with even squares. There is something about this I like. I like how the colors work together and how it moves from the blues to the pinky oranges.